The trip to Alaska was a huge success! We had to switch planes going up to Seattle, and it must have not been a good day for flying, because it was very bumpy! But once we got to Seattle it was worth it! We saw the Space Needle that night, and Starbucks Reserve Roastery! We learned so much about coffee beans and the process of getting them ready to get grounded up into coffee! Then we went to Pike Place Market and man alive! There was so many different foods, jewelry, coats, rugs, and there was even a group of people throwing fish over peoples heads! Then after we got some dark chocolate vinegar, we headed on over to the Ferris Wheel! We were so high and everyone looked so tiny! Time for lunch! We had some of the best clam chowder I have ever had! We must have lost track of time, because now it is 12:30 and we need to walk back over to the hotel(which is about a 30 minute walk) by 1:00! Lucky we make in time to get everything together and go! We get on the boat to Alaska and watch “The Greatest Showman” for the millionth time and we enjoyed it for the millionth time( side note: BEST MOVIE EVER!) We decide that we need to go eat some supper and I’m glad we did! The pork chop was soo good! The potatoes, asparagus, and artichokes were amazing! Then it is time for dessert and the cremé brûlée was amazing!! The first day is just a day at sea so we explored the boat and the kids got to design their own t-shirts! In the evening we had to dress formally and take at least 20 pictures! But the good thing was, we got to eat right after! I forgot to take a picture of the beef, but I did take a picture of the dessert! A chocolate mousse on a brownie with raspberry sauce! Our first port of call was Ketchikan and there was so much to see! We went through a ton of shops and dad got a cap and I got a lanyard to hold the cruise card. We also saw this sign: Then we go on the Deadliest Catch boat to sail around and hold some sea wildlife. We even saw some bald eagles! They were really cool! Once on the boat mom and I decide to go to the afternoon tea, and let me just say, I don’t think I’m cut out to be an English person!😂 Supper was Italian night so Spaghetti and Meatballs it is! In the morning we go scenic cruising in Tracy Arm Fjord! It was so beautiful with all the icebergs and an occasional glacier and so many snow capped mountains! Lunch on the boat is so good! I had some meat tortellinis as an appetizer, and they were the bomb! This is one of my favorite parts of the trip! Juneau!!! We saw the Mendenhall Glacier, Nugget Falls, a salmon hatchery, and went to a salmon bake and roasted marshmallows! Everything was so good! Our last port in Alaska was Skagway where we rode the White Pass train! Then we go back on the boat and go eat supper at Crown Grill. It was ssoooo good! I had the New York Strip with fries and veggies! For dessert we had a sample of everything they had! Then we go outside and see one of the best sunsets ever! Yet another day at sea and the kids get to design their own backpacks! And yet again, it is formal night! And again we have some great food! Our last stop was Victoria, British Columbia, Canada! It was really cold, but we met some other kids and played with them at the park! Overall the trip to Alaska was a ton of fun! I’m so glad we get two weeks for spring break because there was so much to do! I had the honor of having lunch with Tony Rose for an interview about Jenna’s Kitchen. Tony is a local radio personality on D93 and he is so much fun! He is also a fellow Auburn Tiger! #auburnroars If you missed it you can catch it on my Facebook Page or here at Lunch with Tony Rose. Next Auburn Archery competed at the State Archery Tournament in Louisville! I had a good score going but completely bombed my first round at 15 meters. I finished with a decent score of 270. One of my 7th-grade classmates won the middle school championship. Congratulations, Isaac Stanley! Our team shot well enough to make it to the National Tournament in May! Happy Easter! Rejoice that,”He is Risen!” Enjoyed a great worship service, ate and rested. My mom and I have been watching this series from the Hallmark Channel, “When Calls the Heart.” It’s a great show! We had a family fun day of bowling and Jump Air Zone! I enjoyed the Southern Birdie Pizza at Azzip Pizza. It had a pimento cheese base, cheese, fried chicken, sweet drop peppers and a sweet tea glaze. Yum! Then we went to the new cookie dough store in town and tried it. It was sweet but wish my toppings were mixed into the cookie dough instead of just put on top of plain cookie dough. Y’all I love watching cookie decorating videos and one decorator that is close to home is Brave Olive Cookies. Ladonna was nice enough to give me a private lesson and show me how to airbrush cookies with royal icing. So much fun! Now I still need lots of practice, so teachers, coaches, friends, and family….get ready for cookie explosions soon! The icing on the cake, was we were able to do the class at Betsy Ann’s House and I got a few new Agnes & Dora outfits! Then today I went on Midday Live on WBKO with Laura Rogers. But y’all, I had to improvise! To get everything set up for the show, we arrive about an hour early. I set my dough out and I guess it dried out and it did not want to cooperate at all!! I said it was easy but it didn’t look easy today, but I promise it is! You can go back and watch the YouTube Video I did on the soft pretzels as proof! But if you need some comic relief, you can watch me sweat here. I ran out of time to talk about my dipping sauce recipes so I thought I would post them here! Hope you enjoy! Every summer we have an abundance of bell peppers. Last year trying to find new recipes to use all of our fresh peppers I ran across an unstuffed pepper soup recipe. It seemed much simpler to prepare than stuffed peppers but still had all the flavors I love in the dish! Enjoy! Let me know if you like it!! Christmas morning is filled with opening presents, figuring out our new gifts, watching Christmas shows and spending time with family! So sometimes breakfast is put on the back burner! So this year we are going to take out the fuss and go to make ahead breakfast items that each family member can grab and go! My dad and brother want to eat as soon as they get up but my mom and I like to eat a little later. This way everyone can get their breakfast whenever they like! I recently did this Midday Live segment with Laura Rogers on WBKO 13 Television about the recipes I’m going to highlight: Muffin Tin Omellettes, Festive Monkey Bread, and Warm Apple Pie Drink. I assumed everyone knew how to make Monkey Bread so I did not show how to in the segment. Yet afterward, I found that many had never made it before so here is how I did it! Cut each biscuit into fourths. Combine sugar and cinnamon and dip each biscuit into cover it. Then place into greased bundt pan. Once all biscuits are covered, place remaining cinnamon sugar in a medium saucepan with butter and brown sugar. Bring to a boil and pour over biscuits. Bake for 10-12 minutes. Once out of the oven let cool for 5-10 minutes. OPTIONAL Get green color mist and spray until fully green. Pipe a ribbon with the red frosting on it to look like a wreath. Enjoy! Note: If you do spray the color mist be in a well-ventilated area. If you don’t it will get very misty! If you don’t have such area, spray in small spurts. I hope everyone has a Merry Christmas and if you try one of these recipes Christmas morning, let me know! It’s been a great first week of fall break! 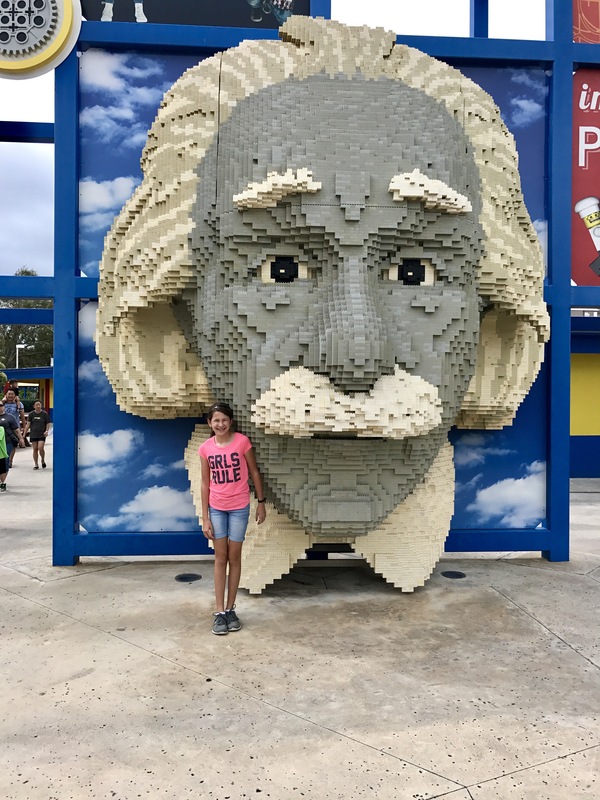 We started the week off in Legoland. It was a trip that my brother really wanted to go to, but I was excited to see what is was all about too! The rides were fun and all the Lego models were cool. My mom put together a highlight video here. The rest of the week has been filled with family game day, movie night, fishing, bonfires and s’mores and of course some cooking! 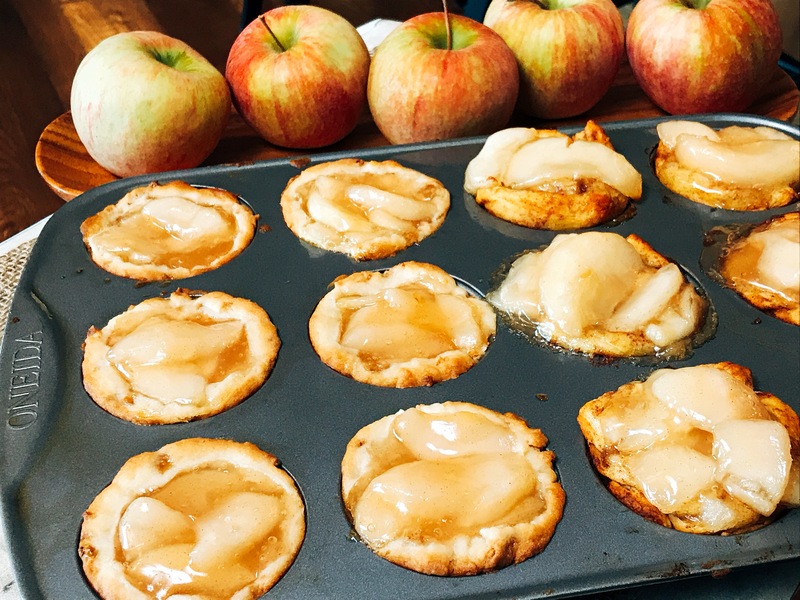 I wanted to share these simple apple treats, so good and so easy to make with kids! Also Uncle Ben’s Rice has a great contest that encourages kids to cook with their parents. 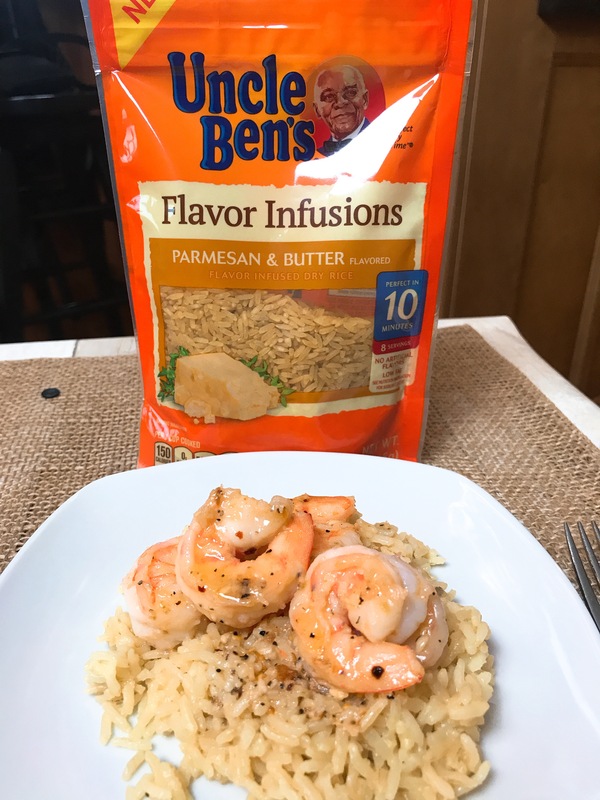 It’s been fun trying all the different flavors, but my favorite has to be this Shrimp Scampi with Paremesan Butter Rice! It sounds fancy but it’s super simple! I cannot wait for the 2nd week of fall break! It’s grandparent time with a visit with Laura Rogers on Midday Live on Friday! If you make either of these recipes let me know by posting a photo or a comment on how you liked it! Thank you to every body that watched my episode on Food Network! Congrats Paige, I can’t wait to eat at your restaurant one day! I want to take a moment to thank a lot of people who have supported me a long the way! Penny Hughes designed,printed, and shipped my t-shirts! Emily Hollen designed and printed my flyer. Jackie Perdue made the photo booth at the watch party. Betsy Ann Tracy made the popcorn bar at the watch party. Hillvue Heights Church let me have the watch party in the worship center! Very cool! Also to the whole HHC crew for the prayers, encouragement and being there to make everything run smoothly! Auburn School for supporting me and helping me make up the work I missed while doing interviews to promote the show. And all the teachers who have supported me all the way! Also I want to thank all the people who helped me get the word out. First Laura Rogers for giving me my very first tv segment. Tony Rose for letting me come on his radio show. He’s so fun! Meryll and Lelan for making me feel at home on Talk of the Town! The News Democrat and Leader and Chris Cooper for my first newspaper interview. To the Beaver Morning Crew for having me on. Lastly but definitely not least, my family and friends! My best friend helped me greet everyone as they come in. My grandma and her friend served the meatballs. My grandpa and his friend helped get everything loaded and set up in the church. Poppy made popcorn! Dad greeted everyone once they walked up. My brother has supported me and has been my biggest cheerleader. Thanks to all my friends that came😊. My mom has supported me, made me happy, helped me through this journey we call life, and just been the best all around mom ever! I love making desserts! So I think I can make a sauce with my Reese’s pieces and marshmallows to make a thick creamy sauce to go on my dough! So while my sauce is cooking I start to prep my dough by spreading melted butter on it and sprinkling some cinnamon sugar on it. Once that is done I spread some of the sauce on my dough then put three cherries on each one. Then I wrap them up and throw them in the oven! Then I start on the whipped cream! I put in heavy whipping cream, sugar, vanilla, and caramel topping! Once my pastries come out of the oven I start plating! I put one pastry on each dish and a dollop of whipped cream and drizzle some caramel on it and viola! I have made a cherry tart with a caramel topping whipped cream! I’m done with 3 minutes to go! Lets eat! Be sure to tune in to Food Network 8/29 at 7 p.m. to catch my episode! I haven’t had much experience cooking lamb, but had fun cooking these lamb chops! My plan is to bread the lamb chops in milk, eggs, and graham cracker crumbs.Then, I get them cooking! Now I have to start on my butternut squash. What can I do with it? I think about making a sweet mashed squash. So I get the water boiling and then let them boil for 20 mins.Thank goodness they are cut into small chunks. I only have 30 mins. you know!Now lets check on the chops. They are perfect, exactly 145 degrees! So now I decide I need to mash my squash with butter and brown sugar.Next lets make something else to fill the rest of the space on the plate. A salad! So I use some of the stuff from the fridge in my salad. It turns out to be spinach, blackberries, carrots, and tomatoes. I toss everything together and quickly whip up a vinaigrette with olive oil, raspberry vinegar, honey, salt, and pepper. 1 minute left!! I need to get everything on the plate! 10,9,8,7,6,5,4 almost 3,2,1 done,0!! Time to dig in! Mystery Basket: Chicken Breast, Naan Chips, Dandelion Greens and Pickled Red Cabbage. 30 minutes, Go! These are perfect ingredients! I know immediately what to do! I am going to make fried chicken salad! So I get the chicken cut so it will cook faster and I have an idea! Crush the chips and use them as a breading for my chicken! Give me chicken and my first instinct is to fry it up! Then I get my greens wilted in butter, garlic, and seasoning! The cabbage juice is full of vinegar so I used it to make a vinaigrette for my salad. I check on my chicken and they are perfect: 160 degrees F. So I take them out any let them rest. Then get my salad going again. I throw in some tomatoes and for mango for color and sweetness. 1 minute left!! So I get plating and throw the salad on the bottom, drizzle on the vinaigrette, add a few pieces of chicken and you know the drill 10,9,8,7,6,5,4,3,2,1,0! Let’s dig in! Be sure to tune into Food Network on August 29th at 7 pm central for Chopped Jr.